This post was originally a guest post but since I have so many friends who are expecting their first babies (yay! ), I thought I would share it on my own blog in hopes it helps someone! I remember that time well. Aside from all of the wonderful baby snuggles and Cloud 9 hormones that make the sleep deprivation worth it, the newborn stage was all about basic survival mode for me and I felt it would be fun to do a post about what kinds of things we used most often when Emily was a newborn- things that I loved and that made things even just a little bit easier! Since breastfeeding was the majority of what Emily and I did in the beginning, I separated my top picks into two categories: Nursing Essentials and Non-nursing Baby Essentials. We used this bathtub from her first bath at home all the way until she was able to stand up and climb out of it on her own! It's great! Oh, boy did we use a ton of these! You can never have too many burp cloths! For the longest time I thought Emily hated being swaddles because she would fight it whenever I tried. Eventually I got to my breaking point in our sleep deprived state and I started swaddling her in this. It held her in and she slept well in it! Okay, so it's probably not that "essential" but babies do need a more sensitive laundry detergent and this one smells amazing! We got a cheap front carrier for like $13.00 at Target and it was a life saver. She hated being put down so hubs and I would carry her in this to do things around the house or even to walk around in public places like the park or grocery store. I wore a nursing cover almost every time I nursed if I wasn't in a private place. It kept me covered up and helped Emily focus on eating. Eventually she grew to hate it and would swat at it, exposing us in the process. But for months it worked well for us! In the beginning stages of nursing, your boobies don't know what's going on. It takes some time for them to adjust to how much milk to supply so sometimes there may be some leakage. 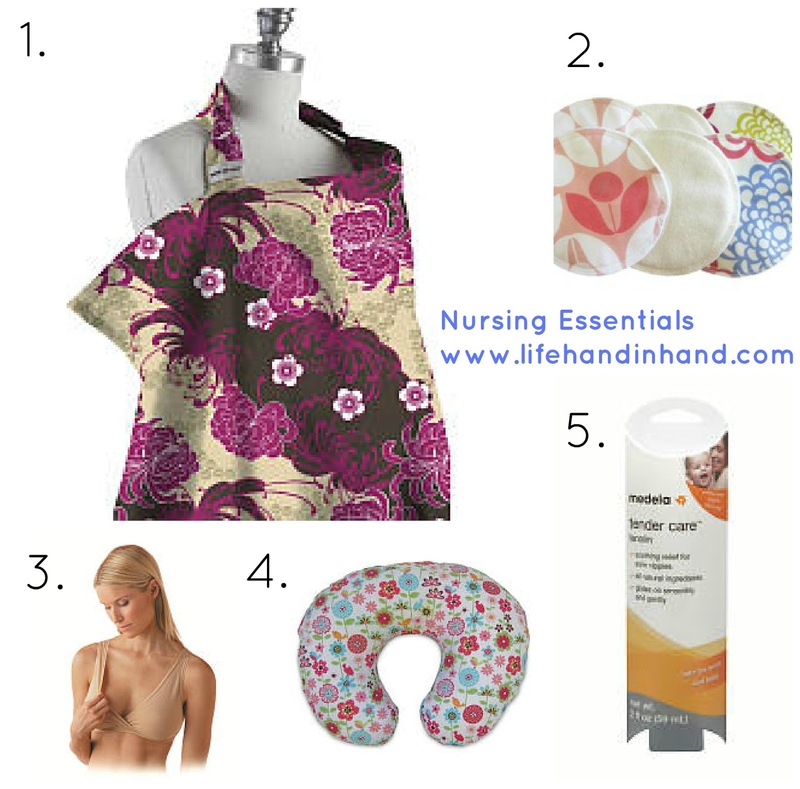 Breast pads are key! I had a love/hate relationship with nursing bras. They weren't always flattering or fit right but once you find the right kind (I liked some from Motherhood Maternity), it's great! This pillow did wonders for supporting Emily during nursing sessions. I could also use it to prop her up when we weren't nursing! I used this cream so much in the first couple of months of nursing. It helped a lot! There you have it! 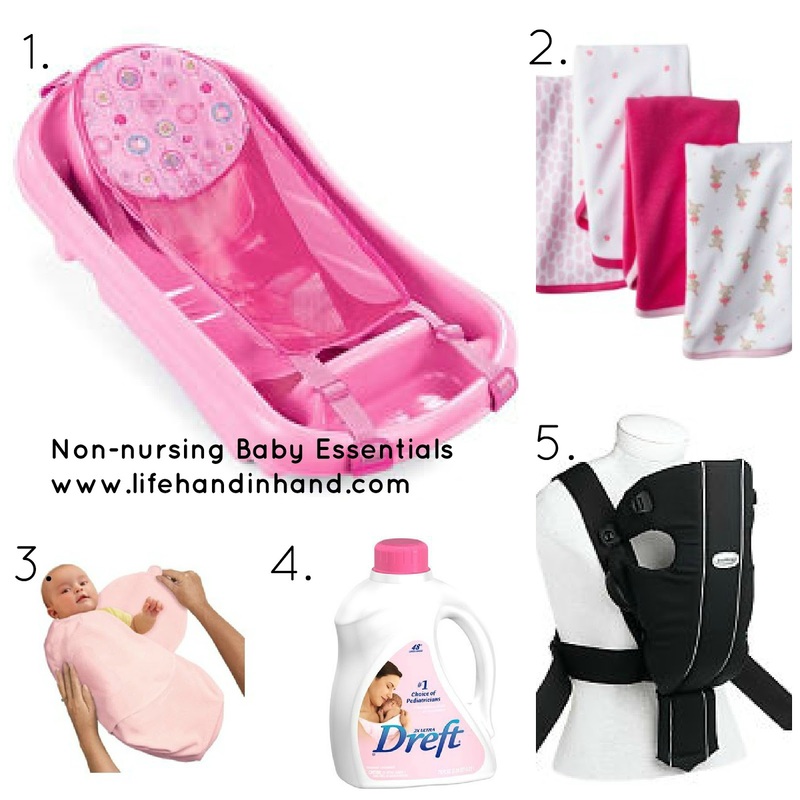 My list of essentials for having a newborn baby! This is good since blog world had a baby explosion! I have the same burp cloths:) adorable! OMG, this is SO helpful. Honestly, it's all so overwhelming! I have no idea where to start, but this was great for me:) Thanks!